If you follow internet message boards devoted to Royal Enfield you will quickly encounter someone wishing that Royal Enfield India would re-create the big, powerful twins the English company made before going out of business. The Royal Enfield Meteor, Constellation and Interceptor were much admired in their day as among the handsomest and the biggest of the vertical twins from Britain. This makes for an amusing discussion and, every once in awhile, there is even an actual rumor (but no evidence) that India might provide a twin. 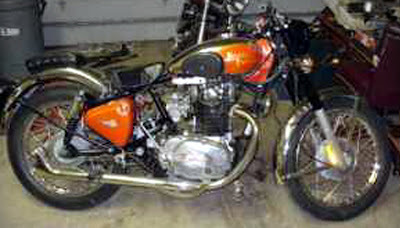 Recently, I came across an Indian Enfield Bullet with a hulking vertical-twin engine for sale on CraigsList for $1,000 "or best offer." Amazingly, some impatient fan of Royal Enfield had built his own! "Nope not (sold) yet. A lot of interest but no follow through yet. Thanks for the mention on your blog. Jessica and Jeff." Why hasn't it sold? Surely, no purist can be offended, now that Royal Enfield India has itself dropped the time-honored iron-barrelled engine and Albion transmission. Where's the sin in fitting a modern engine into a 2001 Bullet? It sure would make for an exciting ride. Naturally, this bike would take some fiddling, given its mixed origins, and would be powerful beyond its braking power. Nothing a Royal Enfield veteran couldn't handle. The pictures make it look sleek and attractive. Where's that fellow who is always dreaming of a twin-cylinder Bullet on the Internet? If you're out there, buddy, Jessica and Jeff are waiting for a call at 574-217-8345.